Guatemala has rejected Bolivia as a compromise candidate. Guatemalan Foreign Minister Gert Rosenthal said his country had not been consulted on the plan to put forward Bolivia's candidacy. He said the move "was apparently a unilateral decision by Venezuela because they have not notified me". "We have not pulled out and we have no intention of doing so," he said. Venezuela's ambassador to the UN, Francisco Arias Cardenas, told the BBC that his country was "willing to help break this deadlock which was created by the United States and its bullying of UN member states to accept Guatemala and block Venezuela." Venezuelan Foreign Minister Nicolas Maduro has said his country still has a "sovereign and legitimate" right to remain in the race for a Council seat. Another possible compromise candidate could be Costa Rica, Mr Arias Cardenas said. The UN General Assembly has been voting since Monday last week to choose between Guatemala and Venezuela. Guatemala has consistently gathered more support in 35 rounds of voting, but neither side has got the two-thirds majority needed. UN rules allow for voting to continue indefinitely until agreement is reached. A 1979 battle between Cuba and Colombia took three months of voting to resolve, with Mexico eventually emerging as the compromise candidate. 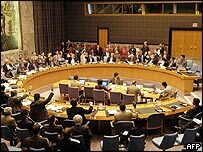 Five of the UN Security Council seats are held permanently by China, the US, Russia, the UK and France. The others are held by regional blocs from Africa, Latin America, Asia, Western Europe and Eastern Europe. Other regional seats, which are rotated every two years, went to Indonesia, South Africa, Italy and Belgium in the first round of voting.